Listen to a radio story about the Sidewalk Steppers from American Routes in 2007. The Tremé Sidewalk Steppers Social Aid and Pleasure Club is based in New Orleans’ famed Tremé neighborhood. 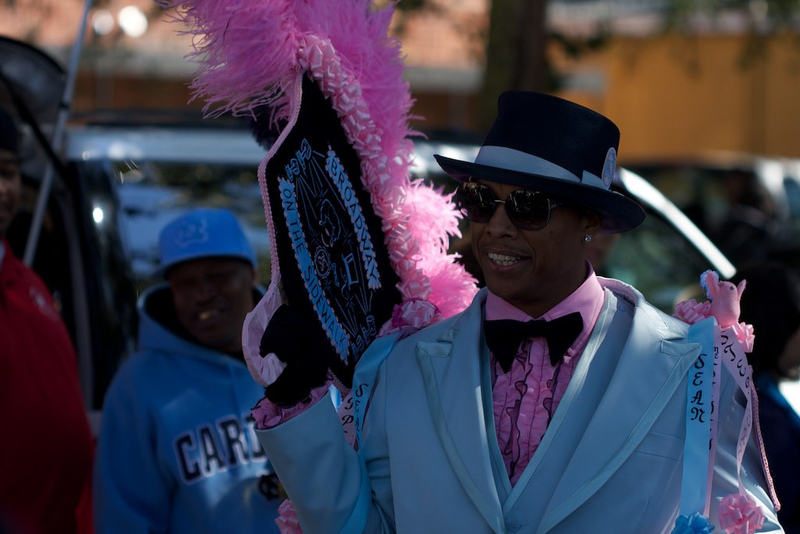 The club is well known in New Orleans for their annual second line parade and the flashy dress worn by each member during the parade. The club members grew up in the Tremé with members of the Rebirth Brass Band, who continues to play their parade each winter. In 2014, Rebirth Brass Band was threatening to retire from the streets, so no one was surprised when they weren’t at the second line parade for their friends in the Sidewalk Steppers. But about hour in, Rebirth came out of nowhere playing “Let’s Go Get Em,” and with them was Trombone Shorty, Corey Henry, and about half of TBC. They absolutely killed it and people went nuts. Rebirth Brass Band at the 2014 Sidewalk Steppers parade. Although the route changes year to year, the parade often stops by neighborhood bars before turning onto Claiborne Avenue alongside the Interstate 10 overpass. Read more about a Sidewalk Steppers parade in my article “Under the Bridge: An Orientation to Soundscapes in New Orleans.